Go easy with Life – Oh! Yes! Abhi! Don’t take yourself or Life too seriously. At the end of the day, Life’s but a dream! A couple of years ago, a young lady came to meet me and my wife, feeling totally despondent about Life. She was separating from her husband, she had two young children and her business was just not working out. She had accumulated a lot of debt – most of it from family. She was wondering if there was any meaning to Life. She asked me: “What’s the point of Life if there’s so much pain in going through it?” I am sure this is a question each of us has asked ourselves at least once in our lifetime so far. I shared with her a story from the Life of the great Chinese mystic, Chuang Tzu (a.k.a Zhuang Zhou or Zhuangzi, 369 BCE ~ 286 BCE). One morning, sitting in his bed, Chuang Tzu looked very sad. His disciples had never seen him so sad. And never after waking up had he remained in his bed, sitting. What had happened? Was he sick? This may well be ‘koan’ – a paradoxical anecdote or riddle without a solution, used in Zen Buddhism to demonstrate the inadequacy of logical reasoning and provoke enlightenment. So, are you who you are? Or is this Life that you lead a dream? In Sanskrit and Pali literature, in the ‘Vedas’ and ‘Puranas’, there’s this concept called ‘maya’ which really points to Life (and everything) as an ‘illusion’, and if you don’t get it and don’t understand Life’s true nature, well, ‘maya’ can also mean ‘delusion’ in such a context! As Chuang Tzu shared his dilemma, his disciples remained silent. They understood the import of Chuang Tzu’s poser. 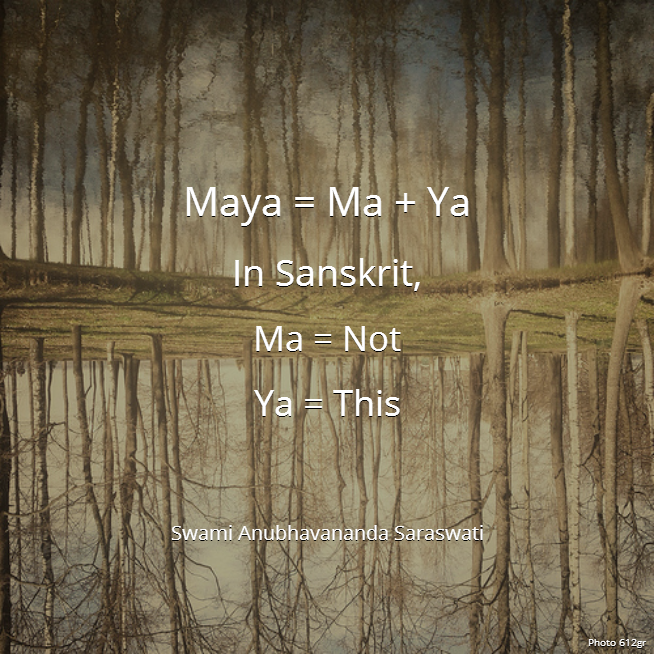 This is what all the scriptures have been saying – that everything is ‘maya’. Everything is a dream. So, why the strife? Why worry, why the anxiety, grief, guilt, anger and sorrow? Chuang Tzu taught his disciples this: “Continue easy with Life and you are on the right path.” He didn’t say this way or that way was right. He said, whatever you are going through, go through it with ease, don’t resist, don’t fight, don’t aggress. Just go easy. Because whatever is happening to you is just a dream. It will soon be over. So, don’t gloat over your riches or your successes. It’s a dream that’s soon to die. Don’t bemoan your sorrows. But it too is a dream and will be over soon. Sometimes, Life can weigh you down. Things just won’t go the way you want them to. That’s the time to learn to take Life easy. As the famous song from the Tamil movie ‘Kadhalan’(1994, Shankar, A.R.Rahman; Hindi – ‘Hum Se Hai Muqabla’) goes, (have a), “….Take it easy, policy!” And have it now – Oh! Yes! Abhi! Author AVIS ViswanathanPosted on May 7, 2014 March 14, 2016 Categories A R Rahman, Chuang Tzu, http://schemas.google.com/blogger/2008/kind#post, Hum Se Hai Muqabla, Inner Peace, Intelligent Living, Kadhalan, Koan, Maya, Oh Yes Abhi, Puranas, Vedas, Zen, Zhoung Zhou, ZhuangziLeave a comment on Go easy with Life – Oh! Yes! Abhi!